We’re less than 48 hours away from the midnight release of Harry Potter and the Deathly Hallows Part 2, and as with many major film releases, the soundtrack has hit stores (and, more importantly, online mp3 distributors like iTunes and Amazon) a few days early. I really enjoyed composer Alexandre Desplat’s work on Hallows Part 1, so I eagerly snatched up this new soundtrack as soon as it came out. Normally, I would spend more time with a soundtrack and do a full review, but this is a score of such sweeping emotional magnitude that I felt compelled to write up some quick first impressions of the score. Keep in mind, I haven’t seen the film yet, so I’m discussing the music largely out of context of the movie. And, of course, it’s impossible to discuss the score with spoiling many details of the film’s plot, by virtue of the track titles and what happens in the book. I assume that won’t be a problem for many of you (I hear the books are popular). I think the best place to start is with my first, most immediate reaction to the soundtrack: Wow. That is one of the best film scores I have ever heard. I don’t say that lightly. I love film scores, and I’ve been collecting them from a young age. I don’t think I’m an expert by any means, but I’ve listened to enough over the years that, at this point, high praise doesn’t come easily. One of the first scores I ever fell in love with was John Williams’ score for the first Potter movie, and while I today think his work on Sorcerer’s Stone is more or less Williams on autopilot, cranking out something ‘iconic’ without taking many risks, it certainly defines the mood of the first film (and the second, where the score was mostly recycled due to scheduling conflicts with Williams). Williams stepped out of his comfort zone big time with Prisoner of Azkaban, throwing out every single theme and motif from films 1 and 2, save Hedwig’s Theme, and doing something new and very original. This score is Williams trying his hardest, and that is something special indeed – it’s absolutely one of my favorite film scores, and easily Williams’ best work of the last ten years. It’s one of the crucial reasons why Prisoner of Azkaban isn’t just my favorite Potter film, but one of my all-time favorite films period. From there, the Potter music has always stayed strong. Patrick Doyle did an admirable job filling in Williams' shoes for Goblet of Fire, forging a very unique aural identity for the film. Nicholas Hooper, meanwhile, did absolutely fantastic work on Order of the Phoenix and Half-Blood Prince with two scores so infectiously fun and, most importantly, full of heart that they even outmatch Williams' first two Potter scores. 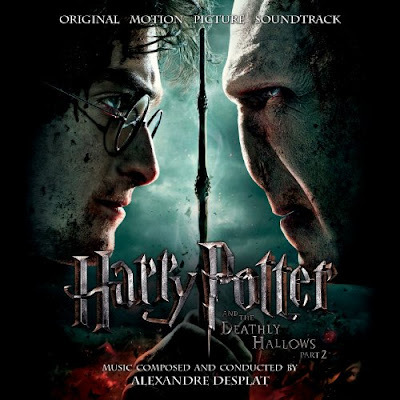 Alexandre Desplat really shook things up for Hallows 1 with a score very different from the rest of the series; it's somber but intensely emotional work that fits the film perfectly, and one of my only complaints about Hallows 1 the film is that Desplat’s score is buried too low in the mix. Desplat’s score for Hallows 2 is quite a bit better, and again, that really is saying something. I think the most obvious thing to mention is that Desplat has achieved something neither Doyle nor Hooper could do, and that’s to weave in the classic Williams themes organically and not let them stick out from the original material. “Hedwig’s Theme” is still used sparingly in Hallows 2, but when it pops up, Desplat has a very specific reason for using it – it’s not just referencing Williams for the hell of it, but to drive in an emotional point. The seventh track, “A New Headmaster,” showcases “Hedwig’s Theme” along with snippets of other Williams motifs, rearranged as a slow sort of funeral piece. I assume this is the moment, in the film, when our heroes discover what Hogwarts has become in their absence – Desplat is using Williams’ music, associated with these characters’ childhood, to demonstrate the passage of time, and how childhood, like everything else, eventually dies. That’s probably my favorite recurrence of Hedwig’s Theme, but there are some other terrific moments, many of them very subtle. “In the Chamber of Secrets” uses some of the opening notes of the “Hedwig” progression as the build-up to a battle march, and later on, the track “Showdown” gives us a full, brilliant rearrangement of “Hedwig” as a triumphant battle hymn. The basic progression in its simplest form is heard maybe half a dozen times on the album, each moment using nostalgia to intercut the building action, a constant reminder of the beginning as we near the end. I’m so happy Desplat figured out how to work in “Hedwig’s Theme” successfully; in the final film, that’s more important than it has been in a while. Nevertheless, the best and most exciting material on the album is the original stuff, which is 99% of what you’ll hear. The chief motif is “Lily’s Theme,” heard in full as the album’s opening track. Simply put, this is one of the most hauntingly beautiful pieces you will ever hear; I haven’t heard a choral voice used this well on a score since Howard Shore’s groundbreaking Lord of the Rings scores. By the time it transitions to strings, “Lily’s Theme” will have already broken your heart into a million pieces; I teared up the first time I heard it. Much of that is how crushingly emotional the music is, practically demanding the listener feel something; but it is also beautiful in its sadness, gracious and precise and wonderfully performed, and as with all beautiful compositions, it’s bound to get an emotional response. Anyone familiar with J.K. Rowling’s source material can understand why this sort of piece is perfect for the film’s chief motif; Deathly Hallows is heartbreaking and beautiful all at the same time, and as Hallows progresses, that terror and heartbreak starts to become beautiful in its own way; first it is poignant, then it is moving, and finally it is uplifting. The same goes for “Lily’s Theme.” Desplat uses it sparingly enough that each time it sounds, it means something different, and by the end, it has stopped breaking our hearts, and instead begins to heal them. There are plenty of other emotional, beautiful moments separate from “Lily’s Theme,” but much of Hallows 2 is battle music; naturally, since this is a war film. Desplat has never struck me as a composer fit to write rousing battle music, but he rises to the occasion and then some. His music for the battle sequences is absolutely fantastic, stirring without going to far; the music should only do so much, and though I haven’t seen the film, I think Desplat hit the happy medium point. Separate from the visuals, you can hear the progression of each step of the fray; each triumph and loss is clearly defined without losing too much subtlety. I can only imagine that, paired with the visuals, the music will really get crowds cheering. But the main brilliance of Desplat’s work here is that all these elements – the emotional material, the battles, and the callbacks to lighter times in John Williams land – combine into one cohesive score. No element overshadows the others; it stands tall on its own as one big, terrific work of music; in the album’s hour and three minutes, you hear the entire emotional story of the film, and that is a big accomplishment. It also indicates that, if for no other reason, the music will make Hallows 2 the film a rousing creative success. This is the best score I’ve heard for a film all year, and certainly deserves recognition come Oscar time. I’d also love to see an expanded score; at a little over an hour, I’m sure we’re missing some material. No matter for now, though. It sounds great as is, and I’m perfectly satisfied for the time being. I can’t recommend this score highly enough, and if you’re interested in purchasing, you can download it from Amazon.com’s mp3 store for only $6.99. I’m usually an Apple loyalist, but iTunes has it priced at an outrageous $13.99. This score is probably worth that, but there’s no denying that, in this day and age, an hour long album should never go for more than ten dollars. Spend the seven dollars, download from Amazon, and enjoy – at the very least, it will get you even more pumped for the final film.